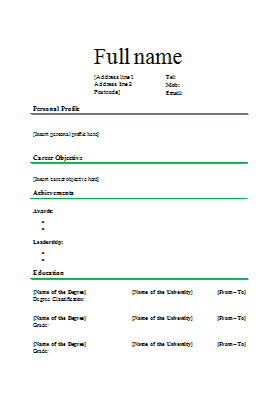 A CV template provides a framework and vital guidelines for writing a CV. Tip: always customise the templates to fit your personality and the job you are applying for! Please note: the above CV templates are presented in the UK format and layout. It’s true that all CVs adhere to a certain standard and guidelines. It would be quite bizarre finding a CV that doesn’t contain the candidate’s name and contact details! There are, however, different CV formats that enable the candidate to fully tailor the CV for maximum impact. These formats, while containing most of the fundamental sections, are sometimes worded different or some sections are presented in different orders. STUDENT CV – As the name suggests this CV is suitable for school leavers, college or university graduates and for people who write their first CV. TIP: Put emphasis on your qualifications since that is usually the biggest selling point you have. You should expand on the different subjects or modules you are/have studied and highlight any competencies/skills gained during your studies. 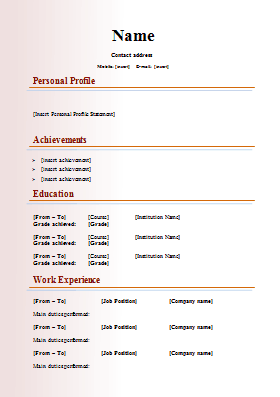 PERFORMANCE-BASED CV (STANDARD) – This CV format is the most popular and is suitable for job seekers from any background. SKILLS-BASED CV – Also known as a functional CV and this format is the best suited for candidates who want to change careers, have career gaps in their employment history or have no experience at all in the field. TIP: Put the most emphasis on your transferable skills and competencies as opposed to qualifications or relevant work experience. Reassure the hiring manager that while you may not have the appropriate education or experience, you do have all the skills required for you to do your job well! With all of this in mind, let’s start working on your CV! Check out Personal Details for more information on this section. Your personal profile shouldn’t be more than 4 or 5 sentences long. Try to back up any claims on this statement with real-world examples (where possible). For example, if you claim to have a “proven track-record in business administration” have you SHOWN any examples of this in your Employment and Work Experience section? Check out Personal Statement Examples for more guidelines and examples. Always try to include this section on your CV because as a well-known saying goes: “if you want to predict someone’s future, look at his past.” What better way to grab the attention of a prospective employer than by highlighting your past achievements? Try to include at least two achievements that you are particularly proud of and which are going to be an interest to the prospective employer. Keep the bullet points short and to the point (e.g. do not write long sentences). Check out Achievement for more information on this section. If you are a student or recent graduate, then your education is probably your main selling point. Try to make this part as clear, compelling and comprehensive as possible. Remember to always, always include the RELEVANT subjects or modules that you have studied (and not simply mention your course title with a few dates). It’s recommended to include grades, particularly when they are at least good or excellent. Any bad grades? Forget about them! Check out Education and Qualifications for more information on this section. Dedicate a lot of your thoughts on this section because this is the most important section of your CV and the one which can make or break your chances of securing an interview. Try to tailor the previous jobs to the job that you are currently applying for. For example, if you’re applying for a Marketing Assistant job, you might have a lot of experience in marketing-related activities from your Office Assistant job – mention them! Check out Employment and Work Experience for more information on this section. Any additional training qualifications you may hold, especially the ones that are relevant to the job, should be included in this section. You should always include a Skills section on your CV because a prospective employer usually spends less than 30 seconds skimming through your CV. That isn’t enough time to work out all your skills from your CV’s other sections. Only mention skills that are RELEVANT to the job and which make you better at performing your CV. Your amazing ballet skills will have zero impact on you performing your day-to-day duties as Business Analyst (well, at least I hope so!). Check out Skills for more information on this section. Use the Hobbies and Interests section to demonstrate that you’re well-rounded person who is engaged in extracurricular activities and in the community. Also mention any plus points about yourself such as volunteering, taking care of your health and always engaging in social activities. Check out Hobbies and Interests for more information on this section. Your references should be two people who know you well and have worked with you in one way or another and who can vouch for you to the prospective employer. Check out References for more information on this section. BONUS: Check out this popular article for some good and bad CV examples. Filled in all the sections? You could have a quick read through these articles for additional tips to further make your CV stand out. Before you climb your rooftop and scream: “I have finished writing my CV!! !“, which I am sure you were thinking of doing, it is important that you double check your CV to make sure that everything is perfect. The visual presentation of the CV is perfect and is nicely fitted into 2 A4 pages. This is the final step. Hooray! You should by now have a nice CV template that you selected, filled in, customised and double-checked for any mistakes. It’s now time to export your CV so that you can start printing your CV and using it to apply for jobs. 6. Click on Save and you’re done! Question: Is it recommended to use a CV Template? Answer: We have found that many people find it very useful to have a clear set of guidelines that they can follow when writing their own CV. It is no secret that structuring a CV, let alone perfecting it, can be a daunting task and anything that can make this process easier and time-efficient is, of course, worth giving a try. Question: What are some things to be aware of when using CV Templates? Answer: One of the biggest mistakes, which should be considered a mortal sin, is for job hunters to use templates without customising them to suit their own ‘brand’ and personality! There are thousands of examples where people have simply stuck blindly to templates – sometimes even forgetting to remove the tips written on them! – and thereby selling themselves short. Question: What are some of the ways in which I can customise CV Plaza’s Templates? FINALLY: please remember that CV Templates are simple and restrictive by nature, so use your creativity and initiative to write your own perfect, personalised CV!